Everyone deserves a bonus every now and then and that’s definitely the case in slot games. When you spin the reels having decided how many paylines to play and how many coins you want to play, the end result of that spin determines whether you have any winning combinations. However, life isn’t all about getting the required number of matching symbols to get a win. 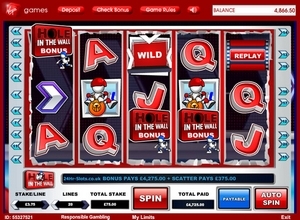 Slot games have a variety of bonus games that can be triggered in several ways. This can be via a certain number of scatter symbols appearing on the reels or a bonus symbol landing on the reels. It’s always a great moment when the first few reels see key symbols land on the reels and you just wait to see if you can get the one you need to get you into a bonus round. Usually games introduce a dramatic piece of music as the remaining reel(s) spin. Bonus games are most commonly found in five reel slot machines. With just three reels there are usually just a handful of paylines and a wild symbol. With five reels though there’s more space to produce more complex games and that’s where scatter symbols and bonus games can come into play. When you play a slot that contains a bonus game that is the key moment you’ll find yourself waiting to trigger. Unless you can land five matching high-paying symbols, it’s in the bonus game where you can really win large amounts of cash which explains why some of them aren’t exactly easy to trigger. 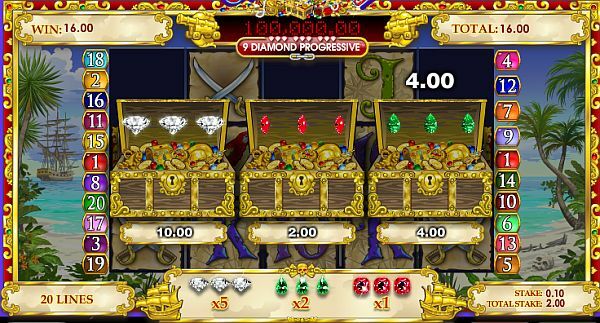 There are several different kinds of bonus games and they are often associated with the theme of the slot. For example in the pirate-themed ‘Chests of Plenty’ game from Ash Gaming, the bonus game features a treasure chest. It’s a pick ’em game which is a popular form of bonus game. As you might have guessed you have a choice of items to pick from, in this case gems. Your task is to find three gems of the same value to win a cash prize. There are plenty of variations on this theme, sometimes the pick ’em feature simply determines the size of multiplier and number of free spins that you have earned. Talking of free spins, that’s one of the most popular types of bonus games. You usually need three scatter symbols or free spin symbols to trigger the game. The number of symbols triggering the bonus round can also determine how many free spins you get. Free spins rounds are always popular as they can be re-triggered and are usually attached with a multiplier for all wins achieved during the bonus round. Often when you do get into the free spins there are added features that can help you get more wins. These include several different types of wild symbols. In the Fremantle Media game ‘Hole in the Wall’ the bonus game sees you having to play a second screen game (as is often the case with bonus games in five reel games) and choose a contestant and hope they can make it through the strange shaped holes in the wall to win a multiplier. Some games require you to collect a certain number of items during a game. For example in the ‘Castle Builder’ slot from Rabcat, you need to collect building equipment before you can try and build the castle for the Princess to live in. It’s important that you know just how the slot works so make sure you have a good look through the paytable. Also have a few free games because that way it won’t cost you anything to trigger the bonus games and you can see just how they work. Bonus Games are a great way of building up your account balance. Just don’t spend too much trying to trigger them in the first place.